These are the crew members in charge of running the Quotes from Elfpackers. Malevolent : The Leader and Organizer of the Quote Crew. He makes sure all crew members are working, that the Elfpack Quotes are running smoothly and being released on time, and he appoints new staff members and retires old staff members who are not properly doing their job. 2011-12-16 [sammie h! 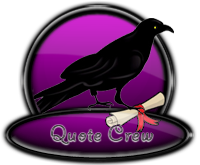 ]: When are you going to start getting new crew members, I have a few recommendations for you. 2011-12-19 [Stephen]: This is on hold for now, so I'm not sure.